Additional Info: Intimal sarcoma (40x) is a rare tumor more often of pulmonary than aortic origin. Pulmonary vasculature tumors may involve the pulmonary valve, directly infiltrate into the lung, or metastasize systemically. 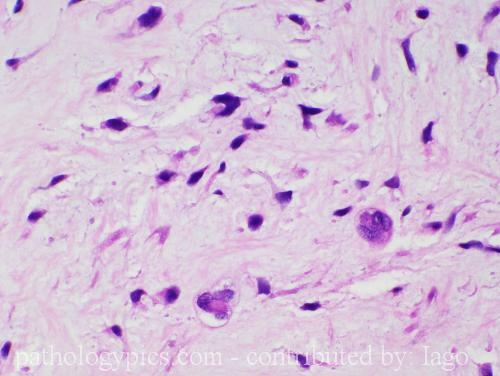 Histologically, these tumors are usually of poorly differentiated fibroblastic or myofibroblastic phenotype. This tumor shows moderate to severe pleomorphism. Mean survival is 5-9 months. A sarcoma disguised as a PE. You don't see that every day (or ever)! and if you happened across it, you certainly wouldn't want to miss it by flying over the 'easy' cases at low power. Nice case. Hello Andreipopel - welcome to the site. Yes, I find Iago quite malignent as well.